STEPLEAD PacTek large-capacity barreled pure water filling machine 5 gallon bottled water production line equipment is suitable for barrel water production, integrating rinsing, filling and capping/sealing. It is an ideal equipment for producing drinking mineral water. The whole machine adopts SUS304 stainless steel. The material is corrosion-resistant, and the downstream conveyor is equipped with a thick stainless steel chain, which is not easy to break. The powerful motor is strong enough to drive the conveyor to stably deliver the bottled water. The electrical components are Siemens, Omron, Festo and many other international famous brands. The production line is controlled by an electrical program, with interlocking, signal, and self-tested situation safety device. STEPLEAD PacTek large-capacity barreled pure water filling machine 5 gallon bottled water production line equipment water filling line adopts programmable control system to operate automatically, power transmission adopts geared motor and pneumatic control system, reliable performance, easy operation and simple maintenance. STEPLEAD PacTek large-volume bottled pure water filling machine 5 gallon bottled water production line equipment, its entire process of washing, filling, capping all carried out in a closed tunnel, effectively preventing the pure water from secondary pollution during the filling process, fully comply with the hygiene standards. The system is made of high-quality stainless steel materials, and other parts are also made of non-toxic and durable composite materials. The electrical and pneumatic systems use imported components, so the equipment has a low failure rate and high reliability. 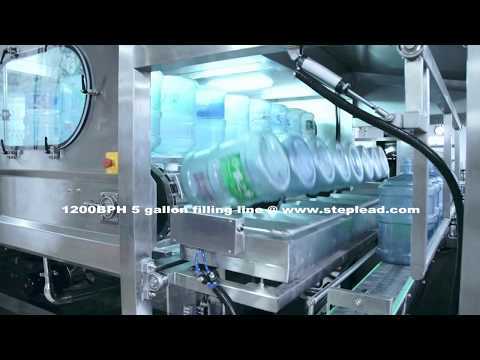 STEPLEAD PacTek large-capacity barreled pure water filling machine 5 gallon bottled water production line equipment is completed by secondary filling. The filling valve is a new type of filling valve. During the filling process, when the detecting switch detects the barrel, the flap cylinder moves upward, and at the same time, the water pneumatic valve is inserted, the filling cylinder moves downward, and the filling valve is opened to start filling. When the filling time signal is input to the PLC, the filling inlet valve is closed, the small flow continues to fill the filling for two seconds, after the filling is completed, the filling cylinder moves upwards, the filling valve is automatically closed; then the conveyor chain starts, the five gallons bucket is delivered to the capping station by the conveyor chain. Controlled by the time relay, the liquid level is accurate, no water is sprayed, the finished water is not wasted, and the excellent filling effect. The design of the main chain cylinder of the equipment is reasonable, the lifting is smooth and coordinated, and the maintenance and adjustment are convenient. The internal washing is flushed under pressure, sprayed evenly, and the inner wall of the barrel is sprayed with pressure water. The water pressure at each nozzle is 0.25 MPa or more; the outer spray is washed for each process. A pressure gauge is installed on the rinsing pipe to observe the rinsing pressure. (1) bottle washing mechanism; (2) bottle holder; (3) a detergent washing pump; (4) detergent tank; (5) pure water pump; (6) transmission chain. (1) filling cylinder; (2) filling valve; (3) cap sorting motor and sleeving device; (4) cap pressing cylinder and pressing device. It consists of a microcomputer programmer and an electric control box. 1. Cap sorting device: It is equipped with a storage box and a rotary sorter. 3. Filling parameters: filling utilization rate ≥90%, cap damage ≤1%, filling capacity up to standard (within the specified range) positive and negative difference 5mm, no significant difference in liquid level.On-site operation: The on-site operation screen is installed next to the filling machine to realize local control, display the working status of the filling line, and have the function of separate manual control; when there is a fault, it can display the fault (such as the motor, liquid level, etc.) And the cause of the fault, and there is an audible and visual alarm, and the system selectively shuts down depending on the alarm level to protect the safety of the equipment. 5. Suitable for bottle type: 3 gallons, 5 gallons of barreled drinking water production. 6. Full functions: The whole machine integrates rinsing, filling and capping functions. 7. The scope of application: ideal equipment for the production of mineral water, distilled water, and purified water. 8. The whole machine is made of high-quality stainless steel, which is corrosion resistant and easy to clean. The main electrical components are all SIEMENS, OMRON, Mitsubishi products, the pneumatic system using imported AirTAC or Festo quality products. 9. Safety protection devices made of aluminum alloy, engineering plastics, and carbon steel spray plating meet the national standards. 10. The use of side-entry bucket mode: small footprint, simplify the conveyor system in front of the palletizing machine, reduce the investment cost of the entire line equipment. 11. Frame structure: The four columns are stressed, the structure is more advanced and reasonable, the movement is lighter and smoother, and the power consumption is smaller.